Law at the End of the Day: Posted Video Recording of Conference "China-Constitution-Politics"
Posted Video Recording of Conference "China-Constitution-Politics"
Pennsylvania State University recently hosted the conference, "China-Constitution-Politics" April 9, 2014. The Conference focused on issues of Chinese constitutionalism and politics (e.g., Conference Announcement: "China-Constitution-Politics" to be Held at Pennsylvania State University April 9, 2014;Considering Zhiwei Tong's Essay, "Two Issues on Constitutional Government in China"). The Conference was recorded. Links to the video recording follow. The recording can be accessed in one of three ways. One is of the entire conference proceedings. The second is of the morning session; the third is of the afternoon session. For ease fo reference, the COnference announcement and Conference Program are also provided. 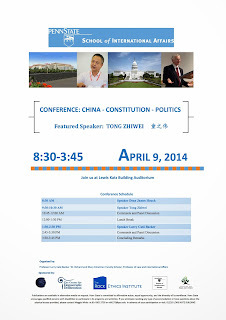 The Pennsylvania State University School of International Affairs is pleased to announce the Conference, “China-Constitution-Politics” to be held at the Penn State Law School, University Park, April 9, 2014. The conference is co sponsored by the Coalition for Peace & Ethics and Penn State’s Center for Global Studies, Center for Democratic Deliberation, Rock Ethics Institute, School of International Affairs. Despite increasing economic ties between world's two largest economies, the United States' strategic and diplomatic engagement with China is implicated by the ideological presupposition that the Chinese political system is intrinsically "undemocratic" and lacks legitimacy. This of course would in turn invite Beijing to interpret Washington's actions with a fixed suspicious lens. Therefore, it is crucial to promote substantive legal dialogue and further mutual understandings of the each other's legal and political systems in order to maintain the long the term constructive relationship between the two nations. China has adopted a written-constitution system. The Chinese Constitution not only reflects the most crucial values that are followed by the nation and its people, it is also a fundamental law with which people who actually rule the nation are determined to comply. Since the “Reform and Open up to the Outside World,” China has modified its Constitution four times since the establishment of the People's Republic and shifted from a planned economy to a Socialist Market Economy from 1993. China's constitution has also added protection of human rights, and rule of law governance. Though the Constitution does not specify the power or organization of the Chinese Communist Party, the CCP has consistently been the primary engine that calls for modifications and implementation of the Constitution. In other words, Chinese constitutionalism presents a coherent but complex normative system memorialized in a simple written constitution, which happens to be compatible with the basic presumptions of conventional constitutionalism in its form while may depart from it in essence. That system divides the organization of the state into two parts, both operating under the normative framework of the constitution—a government apparatus charged with the lawful operation of the state, and a Party apparatus charged with the elaboration of the substantive principles of constitutionalism and its application. However, since the establishment of the Soviet Union, Western constitutional theory has tended to look suspiciously at the constitutionalization of Marxist Leninist government under the leadership of a single party in power. These judgments have formed the basis of analysis of Chinese constitutionalism as well, serving as the foundations for critique especially after the structural reforms of Deng Xiaoping and his successors after 1989. But are these criticisms inevitably correct in general and wholly applicable in the post 1989 Chinese context? Put another way, is it possible to theorize a state-party model of state organization that remains true both to the ideals of constitutionalism grounded in the core postulate of rule of law governance and to the Marxist principles under which the Chinese state is organized and through which it is governed? Chinese constitutional scholars, on the other hand, have been building on emerging global notions of constitutionalism to both embed their constitutional experiment within these larger currents and to theorize the distinctions between the Chinese and other models. If the development of such a model is possible, what does that mean for purposes of implementing a rule of law society in China and how does that translate into the relationship among the people, the Party and the state? These questions suggest both the potential and difficulties of a global conversation about Chinese Constitutionalism as theory and as applied, on its own terms and in terms of the global constitutionalist discourse. Moreover, it suggests a useful point of engagement with the Chinese constitutional project that would also reflect on issues common across constitutional systems, especially that of the United States. Principally this focuses on the “implementation gap” between the ideals expressed in constitutional language and the realities of actual state practice. The United States has wrestled with these issues for a long time, and much of its constitutional jurisprudence reflects this drive toward constitutional harmony between theory and practice. Like the majority of states, the legitimacy of the Chinese government and governmental actions is assumed to be judged by their conformity to the constitution. However, even if one considers the Chinese constitution itself legitimate, it does not mean that China adheres to the rule of law as defined by its constitution. There is a major gap between “text” and “reality” when it comes to implementation of China’s constitutional principles, meaning that the political and administrative practices by state and party authorities often fail to adhere to Chinese constitutional requirements. The questions, and the dialogue they produce reminds us that great states, like the United State and China, share a common tradition of always seeking to review and improve their constitutional systems, though the roads taken by these two great powers to that end do not always coincide. China's political system is founded on the unique role of the Chinese Communist Party, not a party in the traditional sense, but the group of individuals who are vested with the political direction of the state. China is beginning to develop a quite distinct approach to democracy and democratic institutions--Chinese democratic socialism--that reflects a quite distinctive approach to the issues of popular engagement with politics, and that is grounded on this distinctive role of the CCP. Its political and constitutional choices, however compatible they may be with those of Western democracies, will likely have greater influence globally as China assumes a larger role in international affairs. This conference brings together prominent scholars of constitutional law in the U.S. and China for the purpose of (1) bridging the research gap in Chinese constitutionalism, (2) exploring the ethical implications concerning the development and application of constitutional principles in China, (3) strengthening the comparative dimension of the study of constitutionalism with emphasis on U.S. and Chinese constitutional developments, and (4) bring a more prominent focus on the issue of constitutional implementation in China. For these purposes, an initial set of collaborative lectures will be delivered at Pennsylvania State University, to be led by Professor Zhiwei Tong from East China University of Political Science and Law and Larry Catá Backer from Pennsylvania State University. These lectures will frame the issues of Chinese constitutionalism that will be elaborated. These will serve as the basis of discussion by participating scholars. Professor Tong is an internationally renowned constitutional scholar of constitutional law. More importantly, he is one of the great public intellectuals in China and a key opinion leader. He plays an important role in the current debates about the direction and shape of Chinese law and politics. Professor Backer is a scholar of comparative constitutional law who has been developing theories of state-party constitutionalism that fall within emerging principles of transnational constitutionalism.